VicRoads has recently contracted Downer to replace the two bridges over the Hopkins River and Hopkins River Valley with one bridge and an embankment. The bridges over Hopkins River on Mortlake-Ararat Road were constructed in 1955. The Mortlake-Ararat road carries 700 vehicles per day, over 30 per cent being heavy vehicles. Over time and through general use, the condition of the bridges has become poor and will not meet traffic load capacity requirements into the future. VicRoads has recently contracted Downer to replace the two bridges over the Hopkins River and Hopkins River Valley with one bridge and an embankment. The Work commenced again on site on 4 September 2017. To accelerate the works Downer will be closing the road/bridge in both directions from Friday 22 September and reopening it in January 2018. 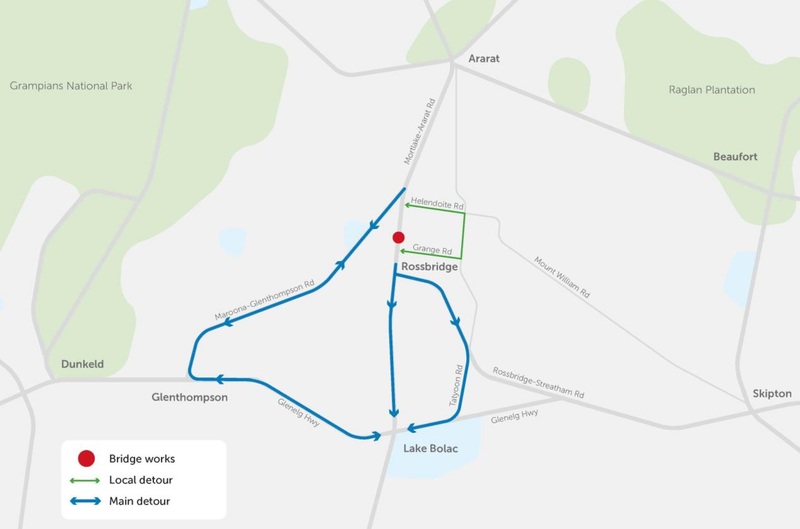 Detours for through traffic will be in place along Maroona-Glenthompson Road (B180) and Glenelg Highway (B160); or via Helendoit Road, Tatyoon Road and Grange Road. Traffic control will be on site during the works to assist with local access affected by the closure. If you have any questions about these construction activities please call 0437 836 220 or email rossbridge@downergroup.com. Downer thank you in advance for your understanding while it improves Victoria’s roads.